Actually it is cool in the right situation. If anyone on this forum that has been a member for a while wants to borrow it for a few seconds and give back just to get that achievement let me know. It requires at least 450 Ego to use. I may have a Level 224 Purple BMG to give up...I've maxed it out and I'm at 708 now. I've been looking for another one but still working on other weapons. Ok can you play this solo? Is it worth it? The world is vibrant, with people all around you playing, but your missions are you own, but if you happen to cross paths with someone else doing the mission, you will work together. The game is rough around the edges, and does not explain that much to you out of the gate, but once it gets the hooks in you...you can't stop playing. It has that big open world that just begs to be explored...cool loot...fun skill trees. It really is one of the best games I played this year. yep...there's solo, there's co-op, then the All-in Shootem ups at Ark Falls and my favorites of just random stuff going on the side of roads where sometimes other players are involved and you just jump in and help. To get a better sense you may search for "Defiance Goals". The load out of pursuits and goals is quite extensive not to mention the additional "contracts and episode" missions. Another thing that you see up there is "Season 1' which means no telling what's coming later. When you pull up the overall map there is a lot blocked out which means those areas could be the next DLC. Yea...when i do the "Boxes' i only open Tier 3 and never Tier 4. i've got some decent stuff like a Purple Rocket Launcher, BMG, Shotguns and Pistols but never a Orange. I am getting tied of landing nothing but shields at every Ark Fall event. i've had to unload I don't know how many blue & purple shields. I never sale my guns/shields/loot that I get....you get very little salvage and I find myself salvage heavy. I always break them down for ark scrap. I quickly found myself with 70,000 ark scrap, which I used to buy 70 keycodes. It is the quickest way to get loot boxes. I only bought one tier 4 box ever, it just seems a waste of keys. 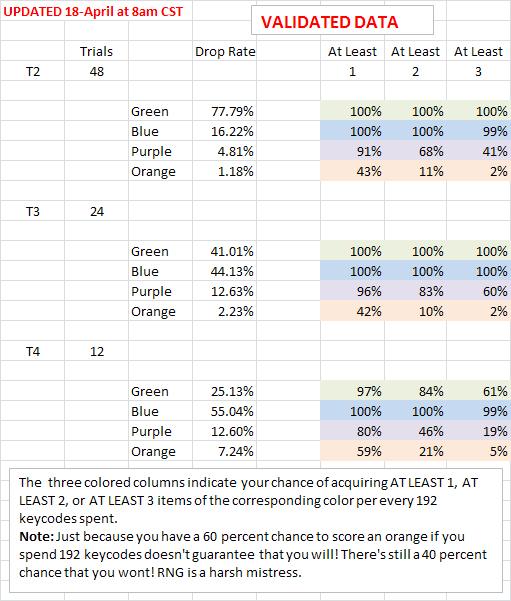 Someone made up a chart showing the chances to get a legendary weapon from a box. After last night of opening five boxes at Tier 3 I have to disagree with those stats...I ended up with two Purple and the rest was split between Blue & green. I only kept three items and broke down the rest. I'm tierd of looking for Orang and will just concentrate on leveling what I have. I'm at 797 and still using a Purple #388 Bug Gun. I've opened close to 30 boxes and had better stuff when I was between 250-500 than what I'm getting now. Gave up my maxed out 224 Purple BMG to a friend in the group who didn't have much nd still at the beginning and got a Purple 875 BMG out of the box. sweet..what is the stats on it? What shield do you use by the way? I only use respark shields...the fast recharge rate of 3 seconds or less before it kicks in and the bit over 2 seconds it takes to fully recharge fits the way I play. I have been changing out between different ones with different elemental resistance, but I got a purple one today that only has a 2.8 second delay, resistance to life leech (something bad in san fran) and has 50% bonus health regeneration. It is a beast shield. San Fransisco is amazing. Love the art design, and the higher difficulty is a plus. You've probably seen or heard us joking about Defiance's creepy, crawly monsters, the Hellbugs. Over 500 million of them have been shot, punted, and disintegrated. This is probably helped by the fact that the starting region's arkfalls (large and random community events) are focused on the burrowing buggers. Speaking of the debris showers, over 1 million have been completed. These net players useful resources (one of the game's currencies) for buying loot chests. They are also the key to winning an appearance on the Defiance SyFy Channel show, which we mentioned earlier this week. Finally, with driving such an important part of the experience, Trion has shared that 50 million miles have been traversed all across the Bay Area. The show has already been renewed for a second season, and we're eager to see what DLC Trion has cooked up for the game. Didn't really have time to check the specs...and there's a bunch listed. I've been needing a good assault rifle and getting a Orange in my EGO range (898) helped big time. I also gave away to a friend in our group my Purple 224 BMG that was maxed out and in the very same chest landed that BMG. Yea...I like the Regen shields. I try to find and use those with a good balance of 3-6 Delay while with a 40% recharge. It helps also if they have something else like 5% less damage while recharge or cooldow or something added. I've got to go in and spend time with my load outs. Several in the group have theirs set based on situation and enemies. On the shileds you probably stand the best chance of landing lots of them at Ark Falls events. That's about all I get along with grenades. In fact I get so many I end up breaking them down...green, blue & purple ones. I wonder what the numbers breakdown by system is. I am thinking of getting this for pc but I'm worried most people will be playing on consoles. going off vgchartz, 300,000 are on the 360...100,000 on the ps3. They don't have true pc sales, because they don't have digital numbers (and many pc games do better digitally) but that tells me at least half a million are playing on pc. It would be nice to some day to play these games cross platform. Saturday and Sunday I spent most of the time playing main missions along with a few time races and Hot Shots. At least four of the main missions were done the same time as another person doing theirs and the extra help did us botha favor. The random part of others joining in be it something happening on the road, Ark Falls or missions is the highlight of the game. This is the very part that if Borderlands had it would've made it about perfect. I also think more are discounting the "professional" reviewS and listening more to those who are actually playing the game. I also think more are discounting the "professional" reviewS and listening more to those who are actually playing the game. the problem with early reviews is it had to be played before the patches, and I heard the game was a mess before the patches...and also, there could not have been that many people playing since it was only people doing the reviews...or they only played the game a few hours before doing the review. That would be like playing fallout 3 for 6 hours and then doing a review. Yea...I'm seeing a lot who are asking about the game and one of the first things they mention is, "well...the reviews aren't good at all so I may wait and not bother". Of course the reviews are like dated the week of release when it was full of bugs...and not the ones you shoot either. Shame one or two couldn't do a "Updated Review" because I'm sure the game would get at least (2+) points. Oh...don't forget the show episode missions...like I've done. i forgot about the first two but got the third one. It was on sale last week wasn't it? Go to your map...then hit LT....when the "Circle" pops up go to "Goals" and hit (A). You'll see two lines in the column...Season One and Episodes....highlight Episodes and hit (A). You should see now four lines representing each week. You cannot go back and try and do past ones....only can do the current. It follows the show somewhat and you interact with the two main characters or sometimes others. Like I said...there is so much to do in this game it's unreal sometimes. The main and side missions alone would be enough but throw in the weekly episodes, the contracts, the random stuff that you see driving around, Ark Falls and of course co-op which I need to do more of. And to think the show is already signed up for another season...makes you wonder what DLC is coming next. Do you have to have Gold to play this with Xbox? I'd rather buy it where there's more population but don't want to pay for Gold. I am not sure how much more time I will spend with it...but I will definitely look into the first dlc and see what it adds. This is the most underrated (by review sites) game since Alpha Protocol. I actually had more fun with it than Tomb Raider, though Bioshock easily remains my game of the year so far. The game is doing good business, but I can't help but feel they rushed it a bit to get it out before the tv show it. With a bit more polish, better tutorial and more exposure this easily could have turned into the next Borderlands. Those that stick through the first 4 or so hours of confusion will be rewarded with a fun time sink.